DA FIRMA KIMONO COMPANY was created out of a love for what we all feel is the most pure martial art in the world. If you are looking for kimono with that “bling-factor”………… we are NOT the right company for you. Our artwork is intentionally designed to be understated; you can let your game be your bling and speak for itself. We placed more effort into the design, cut, fit and feel using only the highest quality materials available. Our kimono was intended to be a “right weight” uniform with our interpretation of a competition cut kimono that everyone can afford and train in every day. Every kimono on the market fits differently; our kimono was cut to have Athletic fit and less cloth for your opponent to grab onto while remaining 100% competition legal. We did not simply call a manufacture and slap our patches on a readymade piece of cotton. We constructed our patterns through trial and error, and after countless prototypes we finally created our masterpiece. We did not just stop at men’s kimonos; we have spent countless hours and made numerous modifications to our WOMEN’S kimonos. We know that women are not shaped let men so we designed a kimono for fit the shape of a woman, and all women have curves from F00 to F5. From the inception of company our number one goal was TOP QUALITY construction fit, feel and value; we deliver all of that starting at $131 .00. Don’t be confused by the price, we would put our kimonos up against the best in the world. 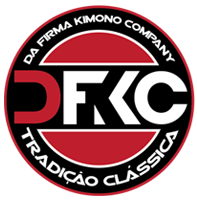 We are DA FIRMA KIMONO COMPANY and our goal is to be the NEW classic and the NEW tradition in the Jiu-Jitsu world. We have gone over and above to make the best on the market, because you deserve the best. Are you an academy owner who wants to look as good as the big boys? Our custom program began as a favor to a friend who owned an academy and has grown to be the largest segment of our organization. We never make out kimonos with screen printed patches, we officer fully embroidered patches, woven patches and direct embroidery (where possible). Again, we don’t just through your artwork on w kimono, we make sure that we color match everything, including the DFKC logo so that you truly have custom product. We don’t stop there; our custom tape is just another added touch that sets us apart from other companies. We do all of this for less than what most companies charge for plain wholesale kimonos. Our team will provide assistance on design, logo patch development and the direction of your new Academy Custom Kimonos. Of course there is more, we can also provide you with rash guards, shorts, hoddies and belts, all cut and sized for men, women and children.